If you’re looking for a day packed with adventure, then this is the perfect tour for you! We’ll show you some hidden gems of the Mayan Riviera, from the ancient ruined city of Coba, to a wildlife reserve where you can see many of the unique species that inhabit the region. 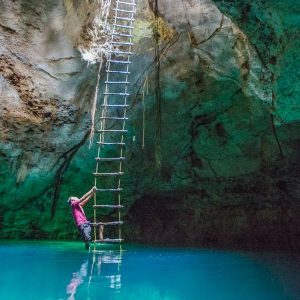 If you’re feeling brave, you can even rappel down into a cenote for a dip! 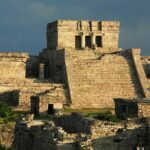 For anyone who wants to see more of Tulum than just their hotel pool or beach, this tour is not to be missed. Your day begins by being picked up in our fully air-conditioned van, before you’re whisked away to the Mayan city of Coba. Here, you’ll be treated to a fully guided tour, to teach you all about what makes this place so special, and the people who once called the city home. Unusually for a Mayan city, Coba is located next to not one, but two lagoons, which give the city its name- “Waters Stirred By Wind”. 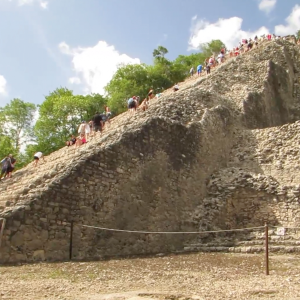 Coba is also yet to be fully excavated, so many of the pyramids and mounds are still covered with trees; it’s a real jungle adventure! 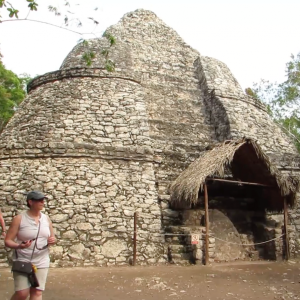 What makes our Coba tours from Tulum unique? 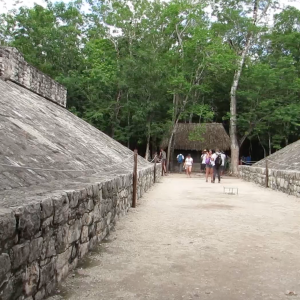 Well, unlike other Mayan ruins in the region, Coba is a little off the beaten track, so not as many people visit here. 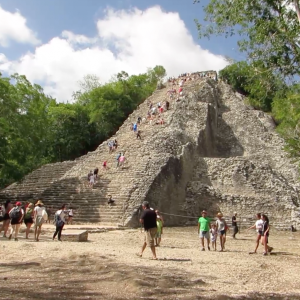 Not only does that mean you can enjoy a Mayan ruins tour away from huge crowds, but it also means that you can climb the spectacular pyramids that dot the former city. 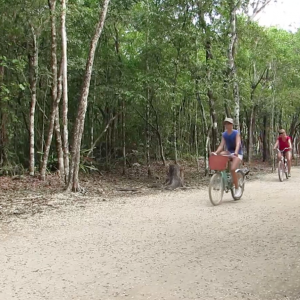 There are few places where you can still do this, so it’s certainly worth making the trip to Coba. 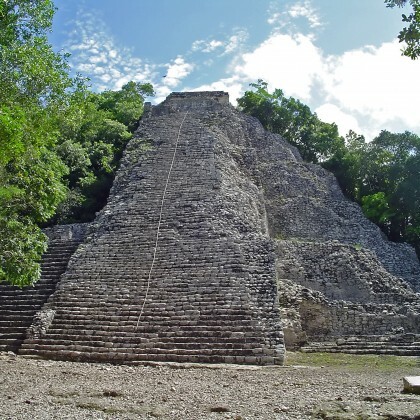 The tallest pyramid, Ixmoja, is 42 meters high, and offers some stunning views out over the forest around you. However, the day’s not over yet. The next stop on our adventure tour from Tulum is the Punta Laguna wildlife reserve, a vast property that’s home to thousands of animals. 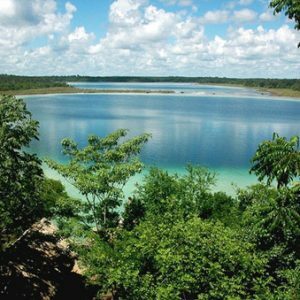 Here, you’ll have the chance to take a tour of the lagoon in a canoe, take a hair-raising zipline over the water, or even rappel down into an underground cenote and take a dip in the subterranean lagoon. There’s so much to see and do here, including a special monkey museum that will teach you all about why these creatures flock to this monkey sanctuary. 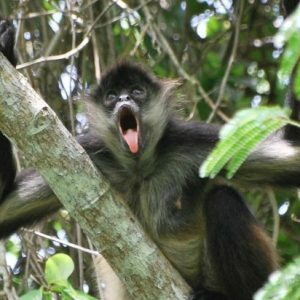 The real stars of the show on our Coba Punta Laguna tour from Tulum are the monkeys that call this wildlife reserve home. 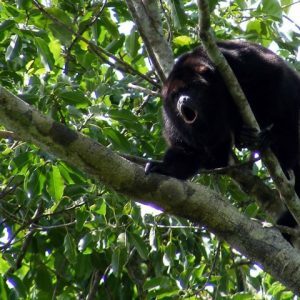 Hundreds of spider monkeys and howler monkeys live here in a special monkey reserve, so during your guided hike through the area, you’ll see plenty of them. There’s much more to see than just the monkeys, too. Peer into the waters, and you might just see a crocodile lazily drifting along with the current. If you’re lucky, you may even spot a puma watching from the trees! 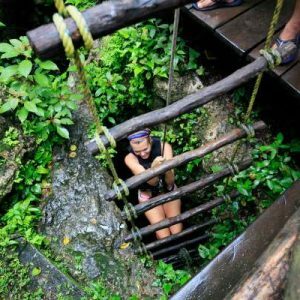 So, if you’re itching to get right to the heart of the Mayan Riviera, then this Coba and Punta Laguna tour from Tulum is simply perfect. 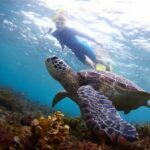 Not only do you get to explore a Mayan ruin for yourself, and climb to the top of one of the world famous pyramids, but you’ll also have the chance to get up close and personal with some of the region’s unique wildlife. 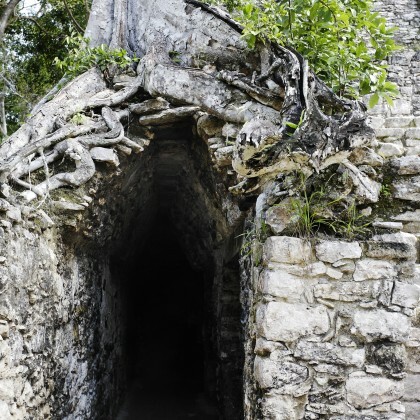 This adventure tour from Tulum has it all- so make sure you book your place today! Multilingual (architectural & adventure) guide who will walk you through the jungle teaching you about the unique Mayan culture and environment. Zip lining through the tropical jungle with breathtaking views where you will feel like a bird! Traditional Mayan feast, prepared by indigenous Mayans in their home village! Tulum pick up approx. 8:30 am, Tour returns at approx. 6:00 p.m.